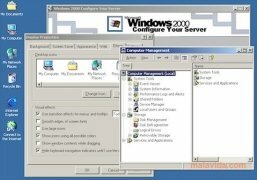 After the great success of Windows NT in the professional sphere, Microsoft launched Windows 2000, the perfect operating system for corporate work, because it offered a lot of stability, and it used all the computers' resources perfectly. All the new features included in this operating system, like the multimedia player integrated into the file explorer, suffer a small checkup with this Service Pack, because its main function is to update the libraries and fix various dangerous security vulnerabilities that had been found. Windows 2000 SP1 also adds compatibility with new devices, like audio controllers, video cards and processors. If you use this fantastic operating system by Microsoft, that was a predecessor of the Server 2003 and 2008 versions, due to the great success it gained in the professional sphere, don't think twice and download the first important update that it received: Windows 2000 SP1. This download requires Windows 2000 Professional, Windows 2000 Server and Windows 200 Advanced Server.